Reminder: Popular Information is published Monday through Thursday. I’ll return to your inbox, bright and early, on Monday, August 20. My friend Walt Hickey writes an excellent newsletter called Numlock that focuses on the numbers in the news. It's a quick read, and I learn something new from it every time. Yesterday, I learned about the disturbing number of medical students who do not attend their classes. You can subscribe at numlock.substack.com. In Monday’s newsletter, I detailed how, despite a growing economy, real wages for workers have fallen over the last year. Over the last 40 years, real wages for workers are flat. Most of the wealth generated by corporations is being distributed to executives and shareholders while workers tread water. There are a lot of contributing factors to this problem but they all boil down to this: workers need more power. On Wednesday, Senator Elizabeth Warren (D-MA) introduced legislation aimed squarely at this problem: The Accountable Capitalism Act. Under Warren’s bill, corporations with over $1 billion in annual revenue would be required to receive a “federal corporate charter.” That charter would require corporate directors to consider all stakeholders in a corporation -- workers and shareholders -- when making decisions. A company that continued to pursue maximum profits at the expense of workers could be sued. Warren’s bill doesn’t just require a new charter. Workers at large corporations would elect 40% of the board of directors. Currently, most executive compensation at public companies comes in the form of stock. This incentivizes CEOs and other top executives to juice share prices. Warren’s bill would also prohibit executives who receive stock as compensation from selling it for five years, encouraging more long-term thinking. Companies are juicing stock prices by buying their own shares. Corporations spent a record $437 billion on stock buybacks in the second quarter of 2018. Warren’s bill disincentivizes stock buybacks. Each time a company buys back shares, its executives are prohibited from selling their stock for three years. Wait, but don’t corporations exist to return value to shareholders? It’s worth taking a step back to consider the corporate form and how it started. Corporations don’t exist in nature. They were created by the state to benefit the public. Ordinarily, people are legally responsible for their actions. If something you do ends up hurting someone, you are responsible for compensating them. If you borrow money, you are responsible for paying the debt. This makes it very risky to do complicated things like building houses or manufacturing cars. People can get hurt, or you can end up with a lot of debt. But people need houses and cars. The corporation was a solution to this problem. The government started issuing corporate charters to incentivize the production of things for the public benefit. The deal is that individuals who own and operate corporations will not be held personally responsible for their actions. Instead, the corporation, a legal fiction, is held responsible. Over time, the requirement that corporations provide a benefit to the public was relaxed. States wanted to attract businesses, so most adopted a “general incorporation” statute that allowed corporations to be formed for any purpose. This was when things started to get out of control. Corporations started to become more powerful than the people who created them. They started to monopolize or ologopolize entire industries. A particularly galling example is the public airwaves, which corporations control through public licenses. Today, politicians must spend countless hours fundraising, frequently from corporations, to pay corporations for access to the airwaves to run TV ads. For a long time, corporations, as currently constituted, were a good deal for the public. They facilitated lots of productive activity and generated an enormous amount of wealth. But if the deal isn’t working well anymore -- if corporate wealth is flowing to a handful of people while leaving workers behind -- the public has the power to change the terms. The corporate form is a privilege, not a right. The question is whether Warren’s bill would fundamentally change the activity of corporations. To answer this question, we can look to Germany, which has instituted a version of Warren’s plan, known as codetermination, since 1976. It’s called codetermination because workers, shareholders, and executives jointly determine the activities of the corporation. Shareholder returns are reduced somewhat, due to lower profitability. The companies are spending more money on wages and less on dividends and stock buybacks which benefit shareholders. Another casualty is executive compensation. German CEO salaries are about half of their American counterparts. But companies like BMW and Siemens are still able to attract top executive talent. As Matthew Yglesias notes, Warren’s plan has an impressive feature: it’s a big idea that cost taxpayers nothing. Generally, ideas that could make a dent in wealth inequality come with substantial price tags. Warren’s plan effectively lets the market do the work, by shifting the ground rules. Despite its attractive price tag, passage of Warren’s proposal would not be easy. Hours after Warren introduced her bill, the attacks had already started. Fox News also joined the fray. Trump refers to the news media as “fake,” “horrible,” and the “enemy of the people.” These attacks have continued after five journalists were gunned down in a newsroom in Annapolis, Maryland. In response, hundreds of newspapers are writing editorials in defense of a free press. The true enemy of any democracy is ignorance, and the only way to battle ignorance is through the acquisition of knowledge: a single set of well-researched, incontrovertible, unbiased facts. The true enemies of the people — and democracy — are those who try to suffocate truth by vilifying and demonizing the messenger. The response to that cannot be silence. Yes, members of the press occasionally get facts wrong. When they do, they are held accountable by their news organizations as well as others in the industry, and far more often than not, the error is acknowledged in the form of a timely correction. The same cannot be said about this president. Trump has not signed any new trade deals. None. 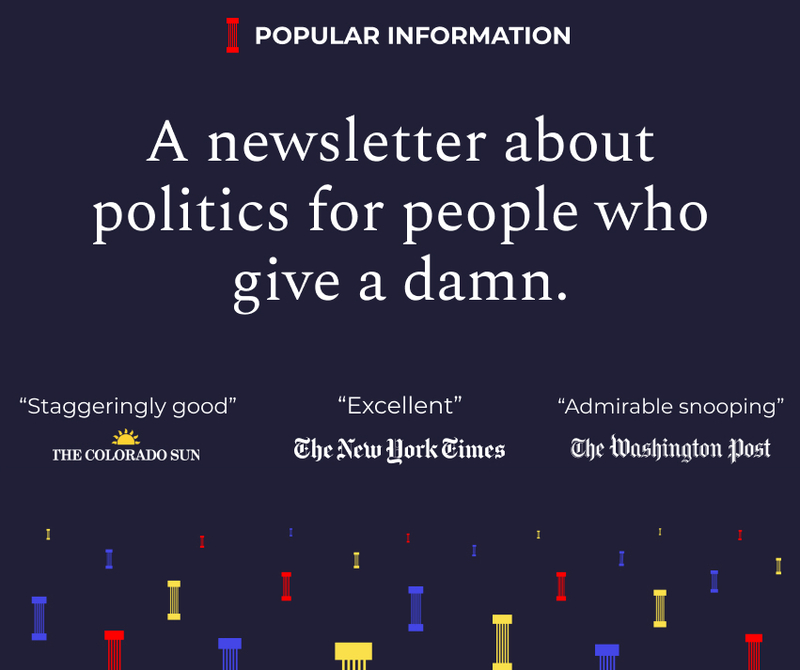 I, aggressively, highly recommend @JuddLegum's newsletter #popularinfo - thorough, concise and erudite. It is all I needed to now cancel my NYT subscription. He intelligently weaves disparate stories, appropriately, together, ties loose ends and eschews hyperbole. Excellent. Love being EDUCATED by straightforward explanations/info in "Popular Information" (@JuddLegum) eg "Our dysfunctional economy." Judd really IS "bring[ing] accurate, unflinching political information to people outside of algorithms controlled by massive tech companies"